Organisers have been able to use social media optimally for their propaganda, which is doomed to be a damp squib. On Sunday, a handful of diasporic Sikh campaigners look set to assemble at London's Trafalgar Square to unveil plans for a non-binding referendum calling for an independent state of Punjab ideally by 2020. 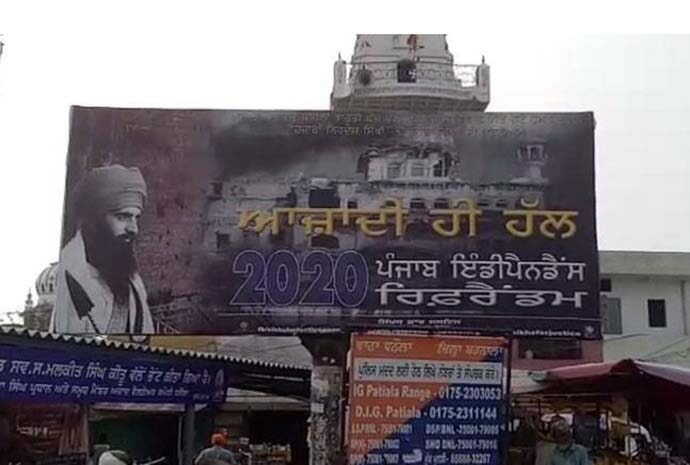 "The objective of the Punjab Referendum 2020 campaign is to give the people of Punjab an opportunity to vote on their future political status," reads an explainer about the proposed exercise on its website, still up and running in India, which has issued a strong protest to the United Kingdom for allowing the much-hyped "London Declaration" scheduled for August 12. "Once there is a consensus within the Punjabi people that independence from India is desired, we will then approach the UN and other international forms and bodies with the goal of re-establishing Punjab as a nation state," say the organisers who identify themselves under the banner of the Sikhs for Justice (SFJ) group. How are you so sure of a consensus and who will determine whether or not it exists among the world's 25-million Sikh population, a majority of which lives in India? The FAQ section of the www.referendum2020.org contains all the fine print that illustrates the futility of the entire circus. "...Punjab Referendum 2020," it acknowledges, "is an unofficial referendum where the outcome is not legally binding on India." Definitely it is not. How can it be? Let's now understand how an official referendum is conducted. It is put forward by governments which agree to give an opportunity to vote in support of a proposal or vote in its opposition. So, it's the state players who call referendums, should they decide to, in order to resolve political dilemmas. Non-state actors staging a theatre in the name of a referendum, therefore, holds no weight. Yet, in advanced democracies, they are well within their right to caricature what otherwise has to be a government-held process. In the SFJ's dream vision, India will one day agree to hold an official referendum at the insistence of the United Nations based on the outcome of the group's private 2020 drill. "With an overwhelming yes vote, this unofficial referendum will start the process through which we will eventually conduct an official legally-binding referendum in Punjab thereby peacefully establishing Khalistan," the organisers say. Unfortunately, it has gained undue publicity. Remember, the separatist movement in Punjab died a quarter century ago. A couple of separatist groups enjoy no popular support in the state now. Young Punjabis are more aspirant than ever before. From Chandigarh to Amritsar, the new generation wants to empower itself with skills in their pursuit of dollar dreams. It would be naive to assume that this breed would land itself in murky waters of secessionism. Among the third- and fourth-generation diasporic Sikhs as well, there's hardly any truck with the calls for Khalistan. Yes, many of them remain committed to their culture and faith and are also resentful of the events of June and November 1984, but that doesn't mean they want a separate homeland carved out of Indian Punjab. How successful are global referendums? Forget a private non-binding referendum, let's take a look at what the official referendums have achieved globally so far. Such exercises, international experts widely believe, aim to find short cuts to complex issues. Look at what happened to the former British prime minister, David Cameron. What did he accomplish when he sought to settle a 40-year dispute within the Conservative Party over membership of the European Union? He got a Brexit in return. In 2014, voters in Colombia rejected a landmark peace deal with rebels, a week after it was signed by president Juan Manuel Santos and Farc leader Timoleon Jimenez after nearly four years of negotiations. In Iraq's 2005 referendum, the Sunnis failed to defeat the country's constitution, fuelling the rise of Islamic State. “This is a tool that’s risky, but politicians keep using it because they think that they’ll win,” Alexandra Cirone, a fellow at the London School of Economics, said of referendums. “It doesn’t have a lot to do with whether this should be decided by the people,” she said. “It has to do with whether a politician can gain an advantage from putting a question to the people,” the New York Times quoted Cirone in a 2016-article titled "Why Referendums Aren't As Democratic As They Seem". If that's the expert opinion on official referendums, unofficial referendums like Punjab 2020 are irrelevant in the bigger scheme of things. But unfortunately, it has gained undue publicity. Organisers have been able to use social media optimally for their propaganda, their posts generously picked by Indian newspapers and TV stations. Indian intelligence and security agencies too have gone the extra mile in advertising Punjab Referendum 2020 with their newspaper plants of its alleged Pakistani links. That said, the whole activity is doomed to be a damp squib. At the most, it can be described as building castles in the air.